X-rays are important for dentists and support time to visualise any tooth disease and surrounding tissue infections that wouldn’t be picked up by an ordinary oral exam. X-rays help the dentist find and treat dental problems early in development. This can potentially save you money, unnecessary discomfort, and maybe even your life. All our practices produce Digital radiography where digital X-ray sensors are used instead of traditional photographic film. The advantage of this is that the quality of the image is better, and has less radiation. At Aim Dental Group we offer a range of different x-ray services which are all important for different reasons. You may find that your clinicians take more than one of these x-rays for different reasons. Bitewing x-rays are to highlight the crowns of the back teeth. We usually take one or two bite-wing X-rays on each side of the mouth every 2 years as a part of your active maintenance visit. Each Bitewing x-ray shows a close up of the back teeth and helps our clinicians find decay in common places like between the teeth. Periapical xrays (PA’s) highlight only one or two teeth at a time. A PA X-ray shows the entire length of a tooth, from crown to root and usually used to see anterior (front) teeth (which the bitewing x-ray does not capture). Depending on your oral health and dental history our clinicians may need to take a periapical x-ray on top of your Bitewings. This is particularly common if you have had major dental work like crowns, bridges, implants or if there is an infection. 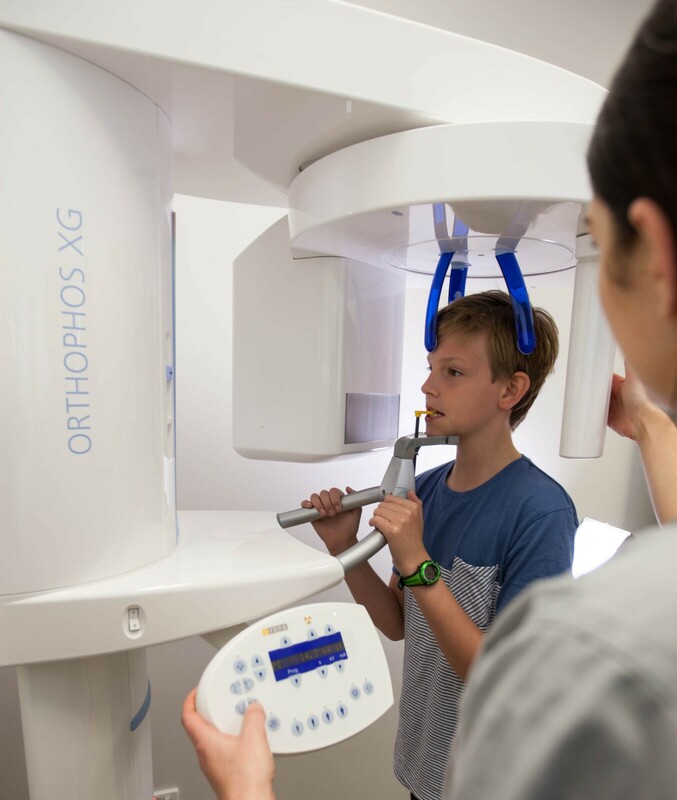 Orthopantomogram (better known as OPG’s) provides a panoramic or wide view X-Ray of the lower face, displaying all the teeth of the upper and lower jaw on a single film. We use this to assess wisdom teeth, bone or gum loss, placement of nerves or sinus in relation to teeth and jaw joints. A Lateral Cephalometric (Lat Ceph) is a side view x-ray of the face, which demonstrates the bones and facial outlines on a single film. Lat Ceph x-rays are necessary prior to the commencement of orthodontic treatment. X-rays are simple, quick and completely comfortable. We offer these x-rays at all 3 of our clinic locations. Contact 1300 AIM DENTAL to find out more about our x-ray services.